Sumatran elephant’s dietary ecology, movement and habitat use: Using ecological approach to save endangered Asian Elephant and their habitat in Sumatra, Indonesia. Land conversion into plantations (i.e palm oil, rubber) is now a main priority of the development programs of most local governments in Sumatra which causes extensive loss of elephant habitat. Conservation efforts for most elephant habitat in Sumatra has focused on increasing the effectiveness of existing protected areas; identifying corridors linking protected elephant range, and better land use planning (Santiapillai & Jackson 1990; Leimgruber et al. 2003). To date, none of these recommendations have been adequately implemented, because of the lack of information on elephant habitat use, seasonal movement and home range area. Almost all of what is known about Asian Elephant (Elephas maximus) ecology comes from a small number of studies in the strongly seasonal environments of southern India and Sri Lanka. There are very few studies that assess and determine elephant dietary ecology in their habitat in the island of Sumatra. Furthermore, no studies have attempted to assess elephant dietary ecology, habitat quality and composition in Sumatra and link them with elephant movement and crop raiding behavior around elephant habitat. Wildlife managers and conservationists therefore face major difficulties when they need to assess the suitability of protected areas or other habitat blocks for Sumatran Elephants. 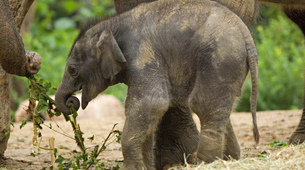 Connecting isolated elephant populations by developing corridors to the larger elephant populations has been suggested to increase the long-term survival of the species. In Bengkulu province, a corridor connecting SECC to KSNP has been proposed by Bengkulu Natural Resource and Conservation Agency (BKSDA Bengkulu) to the Directorate General Forest Protection and Nature Conservation, in the Indonesian Ministry of Forestry (PHKA). 3. build predictive model of crop raiding around SECC.